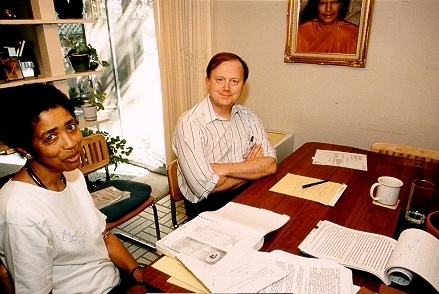 Nayaswami Naidhruva and Ananda’s attorney, Jon Parsons, during the “War Years” of SRF’s lawsuit against Ananda. My direct experience of the facts presented in this book came primarily through twelve years of litigation, instituted by SRF against Ananda, the spiritual organization founded by Swami Kriyananda. Though I had been trained as a lawyer, I left the practice of law when I moved to Ananda Village in Nevada City, California in 1980. After SRF filed its lawsuit against Ananda in 1990, I became involved in law once again, working with Jon Parsons, Ananda’s attorney, on the SRF case and subsequently on the related Bertolucci lawsuit. I also worked closely with Swami Kriyananda during this time and was in regular, often daily, contact with him. Many of the attitudes and actions of SRF’s leaders discussed in this book were the subject of depositions, court testimony, and documents filed with the court. Most of these documents are a matter of public record; they confirm the picture of SRF presented by Kriyananda in this book. The SRF lawsuit, as the United States federal court judge correctly perceived, was an attempt by SRF to “put Ananda out of business” through SRF’s claim of exclusive rights to Yogananda’s teachings. The lawsuit sought not only to eliminate Ananda as a viable Yogananda organization, but also to undermine Kriyananda’s reputation and credibility as a spiritual teacher and spokesman for Yogananda. Later, with the filing of the Bertolucci lawsuit, the attempt to tarnish Kriyananda’s reputation gained added momentum. Indeed, from that point on, Kriyananda was under attack in every aspect of his life. Everything he’d ever worked for was in jeopardy—even the copyrights to the many books he had written and the music he had composed. Kriyananda was not the aggressor in these lawsuits, but when forced to defend Ananda and himself he did so with courage, determination, and creativity. Principles were at stake and he fought hard, at the same time seeking ways to promote harmony between SRF and Ananda whenever possible. Kriyananda was very concerned that this legal fight between two “first-generation” Yogananda organizations would negatively affect the future of Yogananda’s work, and he was willing to make appropriate concessions to settle the lawsuit. Despite his best efforts, no compromise or settlement proved possible. In situations of the type Kriyananda now faced, a person’s character is revealed. What I observed was that Kriyananda never flinched before hard truths, and wasted no energy wishing that things were other than they were. Scrupulously honest in the presentation of his defense, he based his positions strictly on the truth of the matters at issue. First and foremost to him was having a clear conscience before God; the courts of man were of secondary importance. He would do his best, but the results were in God’s hands. Though in what might be called absolute personal jeopardy, Kriyananda was always compassionate, never harsh. Even with everything he believed in at stake, he never neglected his spiritual responsibility to the Ananda members involved in the defense of the lawsuits (“the legal team”). An example: There came a time in the second lawsuit when, with the trial date approaching, Ananda’s legal team decided to hire a trial attorney when Kriyananda was out of the country. Upon returning, Kriyananda saw at once that the attorney was the wrong choice for Ananda. But when the legal team failed to see what was crystal clear to him, he acquiesced in its choice. He adhered to one of Ananda’s guiding principles, that “people are more important than things”—that people be allowed to make mistakes and learn at their own pace. He writes in this book that it was contrary to his way of leading Ananda to assert his will against others if they were not receptive to his guidance. As things turned out, the choice of trial attorney proved disastrous. Kriyananda had known it would. In the same spirit of non-attachment and surrender to God’s will, Kriyananda never abandoned his spiritual responsibility to those who formerly looked to him for spiritual guidance. After the lawsuits ended, he wrote a friendly caring letter to a key witness against him and Ananda, a former Ananda member, suggesting that in future she consider more deeply the consequences of her attitudes and actions. Kriyananda apparently still believed that this woman could fulfill the spiritual potential he had once seen in her. Ultimately the message of this book is one of hope. Kriyananda makes clear that a healthy spiritual organization is based on discernible principles, not happenstance. The final chapters include a detailed listing of the principles he has followed in leading Ananda. Leaders trained by Kriyananda and now leading Ananda according to these principles have shown them to be realistic and attainable—ten years after the end of the lawsuits, Ananda continues to thrive and grow. Seen from this vantage point, Yogananda for the World is both a handbook on leadership and a clear statement of what Kriyananda considers to be the true guidelines Yogananda left for a spiritual work in this New Age of Energy.